Recent advances in molecular biotechnologies have fundamentally changed how cancer patients are diagnosed and treated. The development of targeted therapies has increased patients’ life expectancy and quality of life with the majority of cancer types. However, predicting treatment efficacy and selecting the optimal personalised therapy for each patient remains a challenge for clinicians. Mainly, the development of resistance to therapy and intratumoural heterogeneity limit successful long-term remissions and cures. The early prediction of therapy resistance or relapse is thus deemed crucial for further improving therapy outcome. Identification of features termed biomarkers, which are derived from patient samples by high-throughput analyses, is an important means to achieve this goal. 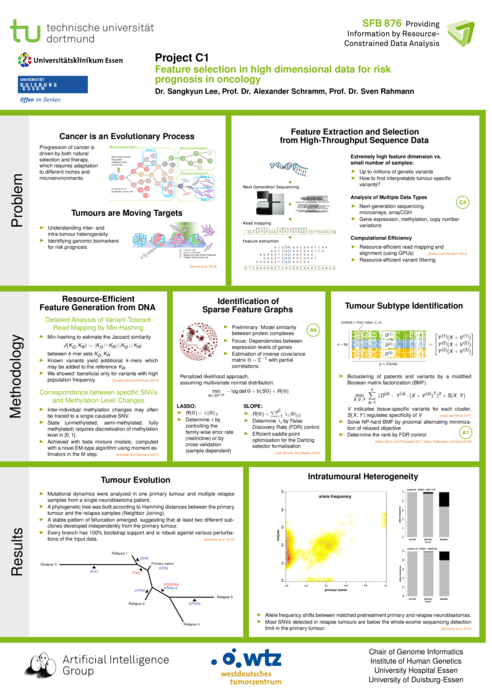 Project C1 builds and optimises models for clinically relevant decisions in oncology by selecting features from high-dimensional feature spaces, extracted from raw data created on different molecular platforms. In the past, highly parallel (“next generation”) DNA sequencing technology allowed researchers with access to specialised sequencing core facilities to discover tumour-specific mutations. As DNA sequencing capacity continues to increase and costs continue to drop faster than computational capacity and storage can keep up, new algorithmic paradigms are needed for the analysis of very large genomic data sets. In project C1, we investigate new algorithms to extract relevant features for biomarker discovery from whole-genome data sets in the 10–100 terabyte range on commodity hardware by streaming the sequence data and filtering for features of interest using novel string hashing methods. Recent developments in nanopore sequencing are democratising DNA sequencing and genome analysis. The new nanopore sequencers are of size comparable to a USB stick, are inexpensive, and can be used without specialised lab equipment. While nanopore sequencing offers lower throughput and higher error rates than established technologies at the moment, it has the potential to turn DNA sequencing and subsequently genomic analysis into a commodity. In oncology, the vision is that nanopore sequencing, together with non-invasive patient monitoring techniques such as “liquid biopsies” drawn from blood or urine, will allow for detection of small amounts of circulating tumour DNAs, allowing an accurate assessment of patient risk and therapy options. In principle, such an assessment would be possible anywhere at any time, given standard equipment of moderate costs, i.e., the sequencer and a laptop or embedded system. For this vision to become a reality, several data analysis challenges must be overcome: In addition to the constraints imposed by small sample size n compared to the high dimensionality p of the feature space (n << p problem), the cyber-physical systems for nanopore sequencing create novel resource constraints: The raw data generated by this new technology is a large-volume high-frequency signal of ion currents, which is difficult to translate directly into a DNA sequence. Therefore, to identify tumour “fingerprints” or biomarkers based on tracing tumour-derived nucleic acids, either better methods for DNA base calling from ion currents are needed, or a different representation of the tumour fingerprints has to be considered, such as features in signal space. We will follow both avenues in parallel and in particular consider novel features derived from a discretised compressed ion current signal space. Hess/etal/2019a Hess, Sibylle and Duivesteijn, Wouter and Honysz, Philipp-Jan and Morik, Katharina. The SpectACl of Nonconvex Clustering: a Spectral Approach to Density-Based Clustering. In AAAI, 2019. Hess/etal/2018a Hess, Sibylle and Piatkowski, Nico and Morik, Katharina. The Trustworthy Pal: Controlling the False Discovery Rate in Boolean Matrix Factorization. In Proceedings of the 2018 SIAM International Conference on Data Mining, SDM 2018, May 3-5, 2018, San Diego Marriott Mission Valley, San Diego, CA, USA., pages 405--413, SIAM, 2018. Schulte/etal/2018a Schulte, M. and Köster, J. and Rahmann, S. and Schramm, A.. Cancer evolution, mutations, and clonal selection in relapse neuroblastoma. In Cell Tissue Research, Vol. 372, No. 2, pages 263--268, 2018. Stoecker/etal/2018a Stöcker, Bianca K. and Schäfer, Till and Mutzel, Petra and Köster, Johannes and Kriege, Nils and Rahmann, Sven. Protein Complex Similarity Based on Weisfeiler-Lehman Labeling. In PeerJ Preprints, Vol. 6, No. e26612, 2018. Hess/etal/2017a Hess, Sibylle and Morik, Katharina and Piatkowski, Nico. The PRIMPING routine---Tiling through proximal alternating linearized minimization. In Data Mining and Knowledge Discovery, Vol. 31, No. 4, pages 1090--1131, 2017. Hess/Morik/2017a Hess, Sibylle and Morik, Katharina. C-SALT: Mining Class-Specific ALTerations in Boolean Matrix Factorization. In Joint European Conference on Machine Learning and Knowledge Discovery in Databases, ECML PKDD 2017, Springer, 2017. Horsch/etal/2017b Horsch, Salome and Kopczynski, Dominik and Kuthe, Elias and Baumbach, Jörg Ingo and Rahmann, Sven and Rahnenführer, Jörg. A detailed comparison of analysis processes for MCC-IMS data in disease classification---Automated methods can replace manual peak annotations. In PLOS ONE, Vol. 12, No. 9, pages e0184321, 2017. Quedenfeld/Rahmann/2017a Jens Quedenfeld and Sven Rahmann. Analysis of Min-Hashing for Variant Tolerant DNA Read Mapping. In Russell Schwartz and Knut Reinert (editors), 17th International Workshop on Algorithms in Bioinformatics, WABI 2017, August 21-23, 2017, Boston, MA, USA, Vol. 88, pages 21:1--21:13, Schloss Dagstuhl - Leibniz-Zentrum fuer Informatik, 2017. Schroeder/Rahmann/2017a Schröder, Christopher and Rahmann, Sven. A hybrid parameter estimation algorithm for beta mixtures and applications to methylation state classification. In Algorithms for Molecular Biology, Vol. 12, pages 21, 2017. Shpacovitch/etal/2017a Shpacovitch, Victoria and Sidorenko, Irina and Lenssen, Jan Eric and Temchura, Vladimir and Weichert, Frank and Müller, Heinrich and Überla, Klaus and Zybin, Alexander and Schramm, Alexander and Hergenröder, Roland. Application of the PAMONO-sensor for Quantification of Microvesicles and Determination of Nano-particle Size Distribution. In Sensors, Vol. 17, No. 2, pages 1-14, 2017. Althoff/Schulte/2016a Althoff, Kristina and Schulte, Johannes and Schramm, Alexander. Towards diagnostic application of non-coding RNAs in neuroblastoma. In Expert Review of Molecular Diagnostics, Vol. 16, No. 12, pages 1307-1313, 2016. Consortium/2016a The Computational Pan-Genomics Consortium. Computational pan-genomics: status, promises and challenges. In Briefings in Bioinformatics, 2016. Johansson/etal/2016a Johansson, Patricia and Bergmann, Anke and Rahmann, Sven and Wohlers, Inken and Scholtysik, René and Przekopowitz, Martina and Seifert, Marc and Tschurtschenthaler, Gertraud and Webersinke, Gerald and Jäger, Ulrich and Siebert, Reiner and Klein-Hitpass, Ludger and Dührsen, Ulrich and Dürig, Jan and Küppers, Ralf. Recurrent alterations of TNFAIP3 (A20) in T-cell large granular lymphocytic leukemia. In International Journal of Cancer, Vol. 138, No. 1, pages 121--124, 2016. Kliewer/Lee/2016a Kliewer, Viktoria and Lee, Sangkyun. EasyTCGA: An R package for easy batch downloading of TCGA data from FireBrowse. No. 4, TU Dortmund, 2016. Lee/etal/2016a Lee, Sangkyun and Brzyski, Damian and Bogdan, Malgorzata. Fast Saddle-Point Algorithm for Generalized Dantzig Selector and FDR Control with the Ordered l1-Norm. In Arthur Gretton and Christian C. Robert (editors), Proceedings of the 19th International Conference on Artificial Intelligence and Statistics (AISTATS), pages 780--789, JMLR W&CP, 2016. Lee/Holzinger/2016a Sangkyun Lee and Andreas Holzinger. Knowledge Discovery from Complex High Dimensional Data. In Stefan Michaelis and Nico Piatkowski and Marco Stolpe (editors), Solving Large Scale Learning Tasks. Challenges and Algorithms - Essays Dedicated to Katharina Morik on the Occasion of Her 60th Birthday, Vol. 9580, pages 148--167, Springer, 2016. Piatkowski/etal/2016a Piatkowski, Nico and Lee, Sangkyun and Morik, Katharina. Integer undirected graphical models for resource-constrained systems. In Neurocomputing, Vol. 173, No. 1, pages 9--23, Elsevier, 2016. Riehl/Schulte/2016a Riehl, Lara and Schulte, Johannes and Mulaw, Medhanie and Dahlhaus, Maike and Fischer, Matthias and Schramm, Alexander and Eggert, Angelika and Debatin, Klaus-Michael and Beltinger, Christian. The mitochondrial genetic landscape in neuroblastoma from tumor initiation to relapse. In Oncotarget, Vol. 7, pages 6620-6625, 2016. Schramm/Lode/2016a Schramm, Alexander and Lode, Holger. MYCN-targeting vaccines and immunotherapeutics. In Human Vaccines & Immunotherapeutics, Vol. 12, No. 9, pages 2257-2258, 2016. Schroeder/Rahmann/2016a Christopher Schröder and Sven Rahmann. A Hybrid Parameter Estimation Algorithm for Beta Mixtures and Applications to Methylation State Classification. In Martin C. Frith and Christian Nørgaard Storm Pedersen (editors), Algorithms in Bioinformatics - 16th International Workshop, WABI 2016, Aarhus, Denmark, August 22--24, 2016. Proceedings, Vol. 9838, pages 307--319, Springer, 2016. Stoecker/etal/2016a Stöcker, B. K. and Köster, J. and Rahmann, S.. SimLoRD: Simulation of Long Read Data. In Bioinformatics, Vol. 32, No. 17, pages 2704--2706, 2016. Berulava/etal/2015a Berulava, Tea and Rahmann, Sven and Rademacher, Katrin and Klein-Hitpass, Ludger and Horsthemke, Bernhard. N6-Adenosine Methylation in miRNAs. In PLoS One, Vol. 10, No. 2, pages e0118438, 2015. Hesse/etal/2015a Nina Hesse and Christopher Schröder and Sven Rahmann. An optimization approach to detect differentially methylated regions from Whole Genome Bisulfite Sequencing data. In PeerJ PrePrints, Vol. 3, pages e1287, 2015. Lee/2015a Sangkyun Lee. Signature Selection for Grouped Features with A Case Study on Exon Microarrays. In Urszula Stańczyk and Lakhmi C. Jain (editors), Feature Selection for Data and Pattern Classification, pages 329--349, Springer, 2015. Lee/etal/2015b Lee, Sangkyun and Brzyski, Damian and Bogdan, Malgorzata. Fast Saddle-Point Algorithm for Generalized Dantzig Selector and FDR Control with the Ordered $\ell_1$-Norm. In 19th International Conference on Artificial Intelligence and Statistics, 2015. Schramm/etal/2015a Schramm, Alexander and Köster, Johannes and Assenov, Yassen and Althoff, Kristina and Peifer, Martin and Mahlow, Ellen and Odersky, Andrea and Beisser, Daniela and Ernst, Corinna and Henssen, Anton G. and Stephan, Harald and Schröder, Christopher and Heukamp, Lukas and Engesser, Anne and Kahlert, Yvonne and Theissen, Jessica and Hero, Barbara and Roels, Frederik and Altmüller, Janine and Nürnberg, Peter and Astrahantseff, Kathy and Gloeckner, Christian and De Preter, Katleen and Plass, Christoph and Lee, Sangkyun and Lode, Holger N. and Henrich, Kai-Oliver and Gartlgruber, Moritz and Speleman, Frank and Schmezer, Peter and Westermann, Frank and Rahmann, Sven and Fischer, Matthias and Eggert, Angelika and Schulte, Johannes H.. Mutational dynamics between primary and relapse neuroblastomas. In Nature Genetics, Vol. 47, No. 8, pages 872--877, 2015. Schroeder/Rahmann/2015a Christopher Schröder and Sven Rahmann. Efficient duplicate rate estimation from subsamples of sequencing libraries. In PeerJ PrePrints, Vol. 3, pages e1298, 2015. Schwermer/Lee/2015a Schwermer, Melanie and Lee, Sangkyun and Köster, Johannes and van Maerken, Tom and Stephan, Harald and Eggert, Angelika and Morik, Katharina and Schulte, Johannes H. and Schramm, Alexander. Sensitivity to cdk1-inhibition is modulated by p53 status in preclinical models of embryonal tumors. In Oncotarget, 2015. Artikis/etal/2014a Alexander Artikis and Matthias Weidlich and Francois Schnitzler and Ioannis Boutsis and Thomas Liebig and Nico Piatkowski and Christian Bockermann and Katharina Morik and Vana Kalogeraki and Jakub Marecek and Avigdor Gal and Shie Mannor and Dimitrios Gunopulos and Dermot Kinane. Heterogeneous Stream Processing and Crowdsourcing for Urban Traffic Management. In Proceedings of the 17th International Conference on Extending Database Technology, 2014. Koester/Rahmann/2014a Johannes Köster and Sven Rahmann. Massively parallel read mapping on GPUs with the q-group index and PEANUT. In PeerJ, Vol. 2, pages e606, 2014. Lee/2014a Lee, Sangkyun. Sparse Inverse Covariance Estimation for Graph Representation of Feature Structure. In Holzinger, Andreas and Jurisica, Igor (editors), Interactive Knowledge Discovery and Data Mining in Biomedical Informatics, Vol. 8401, pages 227--240, Springer, 2014. Lee/2014b Lee, Sangkyun. Characterization of Subgroup Patterns from Graphical Representation of Genomic Data. In \'Sl\c ezak, Dominik and Tan, Ah-Hwee and Peters, JamesF. and Schwabe, Lars (editors), Brain Informatics and Health, Vol. 8609, pages 516--527, Springer, 2014. Lee/etal/2014a Sangkyun Lee and Jörg Rahnenführer and Michel Lang and Katleen de Preter and Pieter Mestdagh and Jan Koster and Rogier Versteeg and Raymond Stallings and Luigi Varesio and Shahab Asgharzadeh and Johannes Schulte and Kathrin Fielitz and Melanie Heilmann and Katharina Morik and Alexander Schramm. Robust Selection of Cancer Survival Signatures from High-Throughput Genomic Data Using Two-Fold Subsampling. In PLoS ONE, Vol. 9, pages e108818, 2014. Lee/Poelitz/2014a Lee, Sangkyun and Pölitz, Christian. Kernel Completion for Learning Consensus Support Vector Machines in Bandwidth-Limited Sensor Networks. In International Conference on Pattern Recognition Applications and Methods, 2014. Liebig/etal/2014d Thomas Liebig and Nico Piatkowski and Christian Bockermann and Katharina Morik. Route Planning with Real-Time Traffic Predictions. In Proceedings of the LWA 2014 Workshops: KDML, IR, FGWM, pages 83-94, 2014. Piatkowski/etal/2014a Piatkowski, Nico and Sangkyun, Lee and Morik,Katharina. The Integer Approximation of Undirected Graphical Models. In De Marsico, Maria and Tabbone, Antoine and Fred, Ana (editors), ICPRAM 2014 - Proceedings of the 3rd International Conference on Pattern Recognition Applications and Methods, ESEO, Angers, Loire Valley, France, 6-8 March, 2014, pages 296--304, SciTePress, 2014. Schnitzler/etal/2014b Schnitzler, Francois and Artikis, Alexander and Weidlich, Matthias and Boutsis, Ioannis and Liebig, Thomas and Piatkowski, Nico and Bockermann, Christian and Morik, Katharina and Kalogeraki, Vana and Marecek, Jakub and Gal, Avigdor and Mannor, Shie and Kinane, Dermot and Gunopulos, Dimitrios. Heterogeneous Stream Processing and Crowdsourcing for Traffic Monitoring: Highlights. In Proceedings of the European Conference on Machine Learning (ECML), Nectar Track, pages 520-523, Springer, 2014. Lee/Schramm/2013a Lee, Sangkyun and Schramm, Alexander. Preprocessing of Affymetrix Exon Expression Arrays. No. 3, Technische Universität Dortmund, 2013. Lee/Wright/2013a Lee, Sangkyun and Wright, Stephen J.. Stochastic Subgradient Estimation Training for Support Vector Machines. In Latorre Carmona, Pedro and S\'anchez, J. Salvador and Fred, Ana L.N. (editors), Mathematical Methodologies in Pattern Recognition and Machine Learning, Vol. 30, pages 67--82, Springer, 2013. Rahmann/etal/2013a Sven Rahmann and Marcel Martin and Johannes H. Schulte and Johannes Köster and Tobias Marschall and Alexander Schramm. Identifying Transcriptional miRNA Biomarkers by Integrating High-Throughput Sequencing and Real-Time PCR Data. In Methods, Vol. 59, No. 1, pages 154--163, 2013. Schramm/etal/2012a Alexander Schramm and Johannes Köster and Tobias Marschall and Marcel Martin and Melanie Heilmann and Kathrin Fielitz and Gabriele Büchel and Matthias Barann and Daniela Esser and Philip Rosenstiel and Sven Rahmann and Angelika Eggert and Johannes H. Schulte. Next-generation RNA sequencing reveals differential expression of MYCN target genes and suggests the mTOR pathway as a promising therapy target in MYCN-amplified neuroblastoma. In International Journal of Cancer, Vol. 132, No. 3, pages 154--163, 2013. Schulte/etal/2013a Schulte, J H and Lindner, S and Bohrer, A and Maurer, J and De Preter, K and Lefever, S and Heukamp, L and Schulte, S and Molenaar, J and Versteeg, R and Thor, T and Künkele, A and Vandesompele, J and Speleman, F and Schorle, H and Eggert, A and Schramm, A. MYCN and ALKF1174L are sufficient to drive neuroblastoma development from neural crest progenitor cells. In Oncogene, Vol. 32, No. 8, pages 1059--1065, 2013. Lee/2012a Lee, Sangkyun. Improving Confidence of Dual Averaging Stochastic Online Learning via Aggregation. In German Conference on Artificial Intelligence (KI 2012), pages 229--232, 2012. Lee/etal/2012a Lee, S. and Stolpe, M. and Morik, K.. Separable Approximate Optimization of Support Vector Machines for Distributed Sensing. In Flach, Peter A. and De Bie, Tijland and Cristianini, Nello (editors), Machine Learning and Knowledge Discovery in Databases: European Conference, ECML PKDD 2012, Bristol, UK, September 24-28, 2012. Proceedings, Part II, Vol. 7524, pages 387--402, Springer, 2012. Lee/Wright/2012a Lee, Sangkyun and Wright, Stephen J.. ASSET: Approximate Stochastic Subgradient Estimation Training for Support Vector Machines. In International Conference on Pattern Recognition Applications and Methods (ICPRAM 2012), pages 223-228, 2012. Lee/Wright/2012b Lee, Sangkyun and Wright, Stephen J.. Manifold Identification in Dual Averaging Methods for Regularized Stochastic Online Learning. In Journal of Machine Learning Research, Vol. 13, pages 1705--1744, 2012. Molenaar/etal/2012a Molenaar, Jan J and Domingo-Fernandez, Raquel and Ebus, Marli E and Lindner, Sven and Koster, Jan and Drabek, Ksenija and Mestdagh, Pieter and van Sluis, Peter and Valentijn, Linda J and van Nes, Johan and Broekmans, Marloes and Haneveld, Franciska and Volckmann, Richard and Bray, Isabella and Heukamp, Lukas and Sprussel, Annika and Thor, Theresa and Kieckbusch, Kristina and Klein-Hitpass, Ludger and Fischer, Matthias and Vandesompele, Jo and Schramm, Alexander and van Noesel, Max M and Varesio, Luigi and Speleman, Frank and Eggert, Angelika and Stallings, Raymond L and Caron, Huib N and Versteeg, Rogier and Schulte, Johannes H. LIN28B induces neuroblastoma and enhances MYCN levels via let-7 suppression. In Nature Genetics, Vol. 44, No. 11, pages 1199--1206, 2012. Piatkowski/etal/2012a Piatkowski, Nico and Lee, Sangkyun and Morik, Katharina. Spatio-Temporal Models For Sustainability. In Marwah, Manish and Ramakrishnan, Naren and Berges, Mario and Kolter, Zico (editors), Proceedings of the SustKDD Workshop within ACM KDD 2012, ACM, 2012. Schramm/etal/2012b Alexander Schramm and Benjamin Schowe and Kathrin Fielitz and Melanie Heilmann and Marcel Martin and Tobias Marschall and Johannes Köster and Jo Vandesompele and Joelle Vermeulen and Katleen de Preter, Jan Koster and Rogier Versteeg and Rosa Noguera and Frank Speleman and Sven Rahmann and Angelika Eggert and Katharina Morik and and Johannes H. Schulte. Exon-level expression analyses identify MYCN and NTRK1 as major determinants of alternative exon usage and robustly predict primary neuroblastoma outcome. In British Journal of Cancer, Vol. 107, No. 8, pages 1409--1417, 2012. Umaashankar/Lee/2012a Umaashankar, Venkatesh and Lee, Sangkyun. Optimization plugin for RapidMiner. No. 4, TU Dortmund University, 2012. Esser/etal/2011a Esser, R. and Glienke, W. and Bochennek, K. and Erben, S. and Quaiser, A. and Pieper, C. and Eggert, A. and Schramm, A. and Astrahantseff, K. and Hansmann, M. L. and Schwabe, D. and Klingebiel, T. and Koehl U.. Detection of Neuroblastoma Cells during Clinical Follow Up: Advanced Flow Cytometry and RT-PCR for Tyrosine Hydroxylase Using Both Conventional and Real-Time PCR. In Klin Padiatr, Vol. 223, pages 326-331, 2011. Lee/Bockermann/2011a Lee, Sangkyun and Bockermann, Christian. Scalable stochastic gradient descent with improved confidence. In Big Learning -- Algorithms, Systems, and Tools for Learning at Scale, 2011. Lee/etal/2011a Lee, Sangkyun and Schowe, Benjamin and Sivakumar, Viswanath and Morik, Katharina. Feature Selection for High-Dimensional Data with RapidMiner. No. 1, TU Dortmund University, 2011. Schowe/Morik/2011b Schowe, Benjamin and Morik, Katharina. Fast-Ensembles of Minimum Redundancy Feature Selection. In Okun, Oleg and Valentini, Giorgio and Re, Matteo (editors), Ensembles in Machine Learning Applications, pages 75--95, Springer, 2011. Koester/2014a Köster, Johannes. 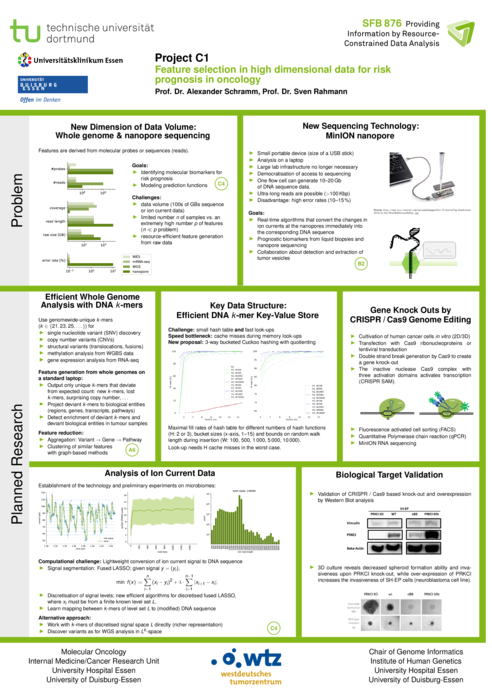 Parallelization, Scalability, and Reproducibility in Next Generation Sequencing Analysis. TU Dortmund, 2014. Martin/2013a Marcel Martin. Algorithms and Tools for the Analysis of High-Thoughput DNA Sequencing Data. TU Dortmund, 2013. Hess/2015a Hess, Sibylle. Untersuchung von Code-Tabellen zur Kompression von binären Datenbanken. TU Dortmund, 2015. Schwitalla/2015a Martin Schwitalla. Optimierung von Genomsequenzanalysen mit Hauptspeicherdatenbanksystemen. TU Dortmund, 2015. Egorov/2012a Egorov, Alexey. Logistic regression with group ell 1 vs. elastic net regularization. TU Dortmund, 2012. Morik/2010a Morik, Katharina. Medicine: Applications in Machine Learning. In Sammut, Claude and Webb, Geoffrey I. (editors), Encyclopedia of Machine Learning, pages 654-661, Springer, 2010. Schulte/Schowe/2010a Johannes H. Schulte and Benjamin Schowe and Pieter Mestdagh and Lars Kaderali and Prabhav Kalaghatgi and Stefanie Schlierf and Joelle Vermeulen and Bent Brockmeyer and Kristian Pajtler and Theresa Thor and Katleen de Preter and Frank Speleman and Katharina Morik and Angelika Eggert and Jo Vandesompele and Alexander Schramm. Accurate Prediction of Neuroblastoma Outcome based on miRNA Expression Profiles. In International Journal of Cancer, 2010. Huebener/etal/2009a Huebener, N. and Fest, S. and Hilt, K. and Schramm, A. and Eggert, A. and Durmus, T. and Woehler, A. and Stermann, A. and Bleeke, M. and Baykan, B. and Weixler, S. and Gaedicke, G. and Lode, H. N.. Xenogeneic immunization with human tyrosine hydroxylase DNA vaccines suppresses growth of established neuroblastoma. In Molecular Cancer Therapeutics, Vol. 8, No. 8, pages 2392-401, 2009. Schramm/Mierswa/2009a Schramm, Alexander and Mierswa, Ingo and Kaderali, Lars and Morik, Katharina and Eggert, Angelika and Schulte, Johannes H.. Reanalysis of neuroblastoma expression profiling data using improved methodology and extended follow-up increases validity of outcome prediction. In Cancer Letters, Vol. 282, No. 1, pages 56--62, 2009. Schulte/etal/2009a Schulte, J. H. and Horn, S. and Schlierf, S. and Schramm, A. and Heukamp, L. C. and Christiansen, H. and Buettner, R. and Berwanger, B. and Eggert, A.. MicroRNAs in the pathogenesis of neuroblastoma. In Cancer Letters, Vol. 274, No. 1, pages 10-5, 2009. Schulte/etal/2009b Schulte, J. H. and Pentek, F. and Hartmann, W. and Schramm, A. and Friedrichs, N. and Ora, I. and Koster, J. and Versteeg, R. and Kirfel, J. and Buettner, R. and Eggert, A.. The low-affinity neurotrophin receptor, p75, is upregulated in ganglioneuroblastoma/ganglioneuroma and reduces tumorigenicity of neuroblastoma cells in vivo. In International Journal of Cancer, Vol. 124, No. 10, pages 2488-94, 2009. Schulte/etal/2009c Schulte, J. H. and Lim, S. and Schramm, A. and Friedrichs, N. and Koster, J. and Versteeg, R. and Ora, I. and Pajtler, K. and Klein-Hitpass, L. and Kuhfittig-Kulle, S. and Metzger, E. and Schule, R. and Eggert, A. and Buettner, R. and Kirfel, J.. Lysine-specific demethylase 1 is strongly expressed in poorly differentiated neuroblastoma: implications for therapy. In Cancer Research, Vol. 69, No. 5, pages 2065-71, 2009. Schulte/etal/2008a Schulte, J. H. and Kuhfittig-Kulle, S. and Klein-Hitpass, L. and Schramm, A. and Biard, D. S. and Pfeiffer, P. and Eggert, A.. Expression of the TrkA or TrkB receptor tyrosine kinase alters the double-strand break (DSB) repair capacity of SY5Y neuroblastoma cells. In DNA Repair (Amst), Vol. 7, No. 10, pages 1757-64, 2008. Vandesompele/etal/2008a Vandesompele, J. and Michels, E. and De Preter, K. and Menten, B. and Schramm, A. and Eggert, A. and Ambros, P. F. and Combaret, V. and Francotte, N. and Antonacci, F. and De Paepe, A. and Laureys, G. and Speleman, F. and Van Roy, N.. Identification of 2 putative critical segments of 17q gain in neuroblastoma through integrative genomics. In International Journal of Cancer, Vol. 122, No. 5, pages 1177-82, 2008. Schramm/etal/2007a Schramm, A. and Vandesompele, J. and Schulte, J. H. and Dreesmann, S. and Kaderali, L. and Brors, B. and Eils, R. and Speleman, F. and Eggert, A.. Translating expression profiling into a clinically feasible test to predict neuroblastoma outcome. In Clinical Cancer Research, Vol. 13, No. 5, pages 1459-65, 2007. Scaruffi/etal/2005a Scaruffi, P. and Valent, A. and Schramm, A. and Astrahantseff, K. and Eggert, A. and Tonini, G. P.. Application of microarray-based technology to neuroblastoma. In Cancer Letters, Vol. 228, No. 1-2, pages 13-20, 2005. Schramm/etal/2005a Schramm, A. and Schulte, J. H. and Klein-Hitpass, L. and Havers, W. and Sieverts, H. and Berwanger, B. and Christiansen, H. and Warnat, P. and Brors, B. and Eils, J. and Eils, R. and Eggert, A.. Prediction of clinical outcome and biological characterization of neuroblastoma by expression profiling. In Oncogene, Vol. 24, No. 53, pages 7902-12, 2005.